If you are going to do birding photography in Kruger Park, these tips and tricks from acclaimed wildlife photographer, Nigel Dennis, who is responsible for the majority of the images on this Kruger Park Birding Guide. Bird photography is generally regarded as one of the most challenging fields in wildlife and nature photography genre. The reasons are obvious. Often the subjects are small, they don't sit still for long, and when you are almost close enough to get a good shot they fly away - very frustrating! 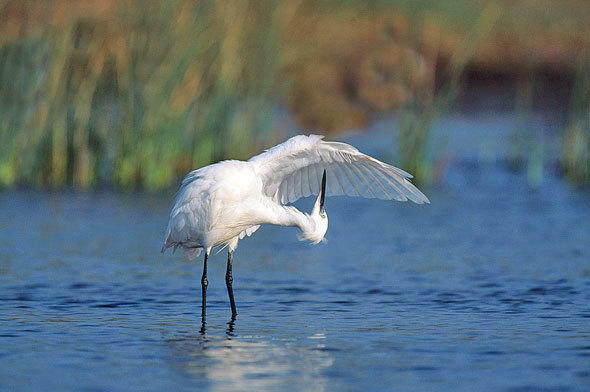 However, visitors to Kruger do have the opportunity to get some quality bird images without great difficulty. Thanks to the high visitor numbers, many bird species have become habituated to the close presence of vehicles and - in the case of the rest camps - people. This makes our normally skittish subjects far more approachable than in most game reserves or other wild areas. The following are a few hints and tips that I hope will assist in your getting some great bird images: The most frequently asked question I hear is what lenses will I need? Ideally a 600mm super telephoto is a great tool. It is also a very expensive piece of glass! You could do some good photography with a 400mm (especially if you are using a mid-range digital SLR camera with a smaller sensor size than a 35mm film camera thus increasing magnification - your 400mm lens will effectively become close to a powerful 600mm!). At the lower end, a 300mm will give some bird photography opportunities but will lack the magnification to get a good shot in many situations. If you are still shooting film, 100ASA or 200ASA will offer a good compromise for both image quality and all, important shutter speed. I would recommend digital photographers use similar settings.Unless you have image stabiliser lenses, it is very important to have a good steady camera support. Use a tripod in the rest camps and the old trusty beanbag is fine when working from a vehicle. Shutter speeds of 125th and 250th second are ideal for static bird portraits. For flight shots of larger birds - the raptors and vultures - 1000th second will freeze the action. When out on the Park's roads, drive even more slowly than you would when game viewing - often you will not spot a bird until you are quite close. Once a subject is sighted, approach very slowly. With a little patience you will be amazed at just how close many of Kruger's birds will tolerate the presence of a vehicle. For waterbirds, Sunset Dam at Lower Sabie is a noted venue. Also, many of the river crossings offer great photography. With a little patience, you may even get a chance of a shot of the elusive African Finfoot. I find a good ploy is to reply 'Actually I'm just photographing a bird - but if you drive up the road there I'm sure you will find a pride of lions'. Works every time - and you will be left in peace to enjoy your bird photography! The vast majority of the images appearing in this Kruger Park Birding Guide were photographed by Nigel Dennis, and published by Prime Origins Publications under the title: Best Birding in Kruger.